I am putting out a teaser recipe to get the blog rolling. This is an Indian street food that I think is almost hearty enough to make a meal. In our usual fusion sort of way, we enjoy this with Polish sausage or kielbasa. For some reason, Arvind says that it wasn’t a common partner to this dish on the streets of Calcutta! 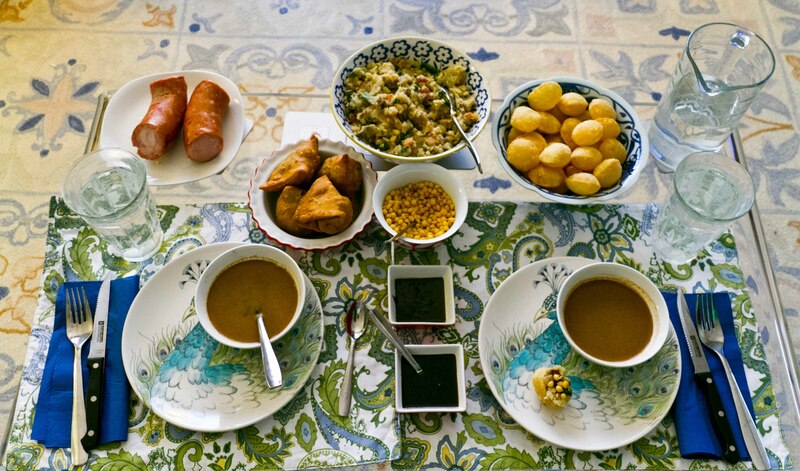 The dish is made of three parts: a crunchy “fuchka” which is a hollow, fried ball, mashed potatoes with veggies mixed in and a room-temperature broth. You make a hole in the fuchka, fill it with the mashed potatoes, dip it all in the broth and eat. 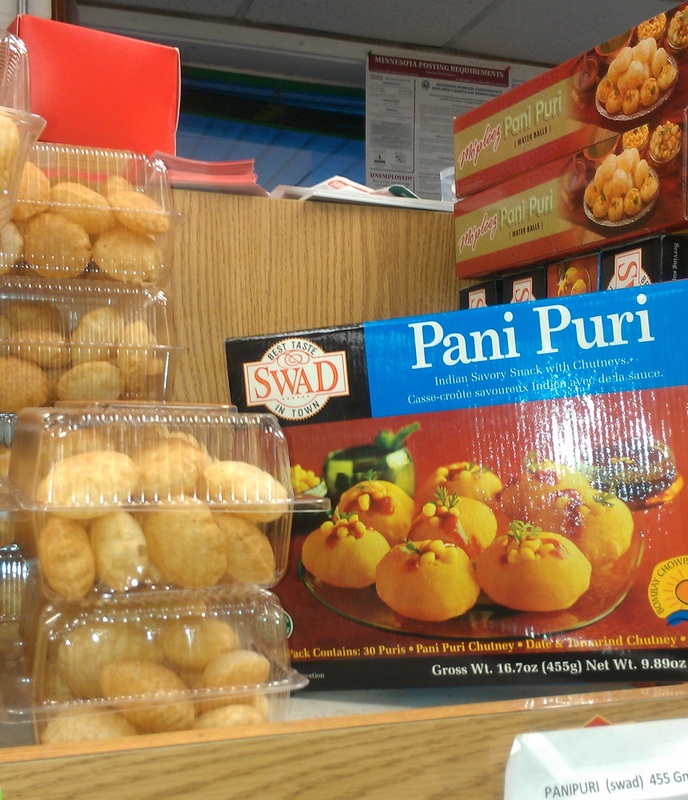 This will require a trip to the Indian grocery store. There are no 2 ways around it. But to take the terror out of that process, I have taken pictures of all the things you need to buy. You can even show the pictures from this blog on your phone to the shopkeeper if you don’t see them. Since this is a really common dish, they’ll have it on hand. I promise. Fuchka come in clear packages or in a boxed set with some extra sauces and little crunchies. I prefer the box. Wash the potatoes and stab them with a fork. Microwave them until they are soft. Meanwhile sauté the onion in a little oil. Once the onion starts to soften, clear a spot in the pan make sure there is little oil there. Add in 1 tsp of chaat masala. Let it sit for a few seconds until you can smell the spices heating up. Once you start smelling them, mix it in with the onions. Then add in the frozen veggies. If they are still frozen, cover and let them cook through. Mash the potatoes in a mixing bowl. Add in a little chaat masala and a little oil. Keep mashing until almost the consistency of regular mashed potatoes. Mix in the onion and veggies. Taste it. 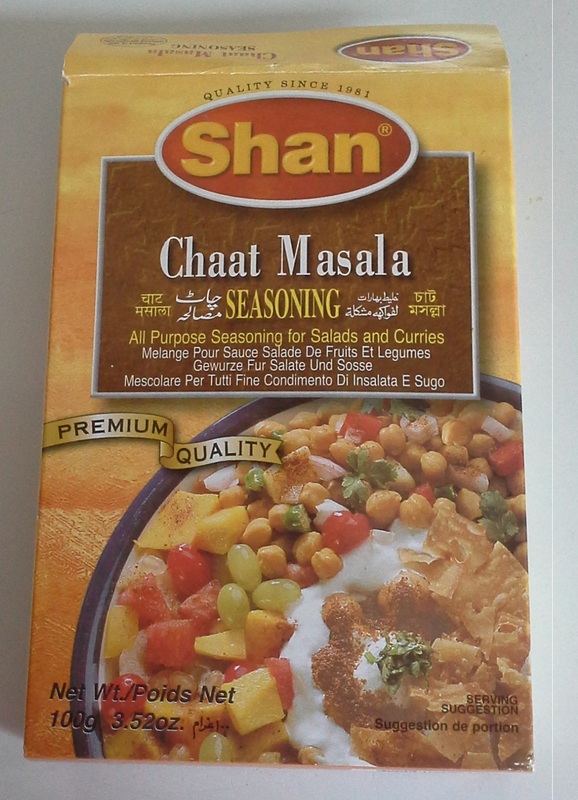 Does it need more chaat masala? Add more if needed Put in a serving bowl. Fill a bowl for each person with water and add 1 tsp of chaat masala to the water and stir until mixed. If you got the kit with all the little sauces put those in little bowls. Put the pani puri in a bowl as well. the chaat masala water a little stir, then dip the whole thing in the water and eat immediately. If you got the set set with the extra sauces and fried chickpeas, you can add those in different combos. Warning – I’m not a fan of their “broth mix”, steer clear – spicy and odd tasting. It makes for a fun, interactive dinner. I would think if you could get it to the table without kids noticing they don’t recognize it, they would like it (or maybe make them some without the spices to be more palatable to them). The fun of stuffing and dipping makes it a very happy meal!